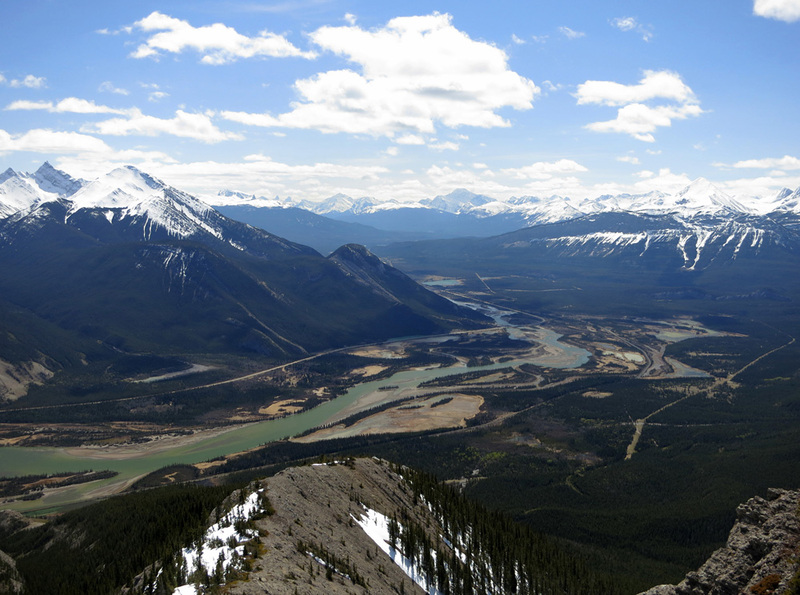 Above: The climb affords a commanding view of the Athabasca River valley, the Palisades, and Pyramid Mountain. 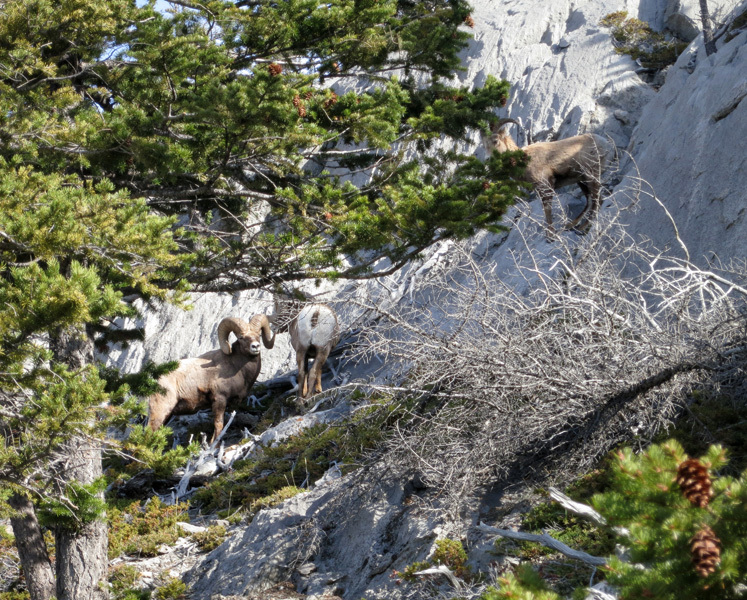 An easy scramble with some bushwhacking along the southwest rib. 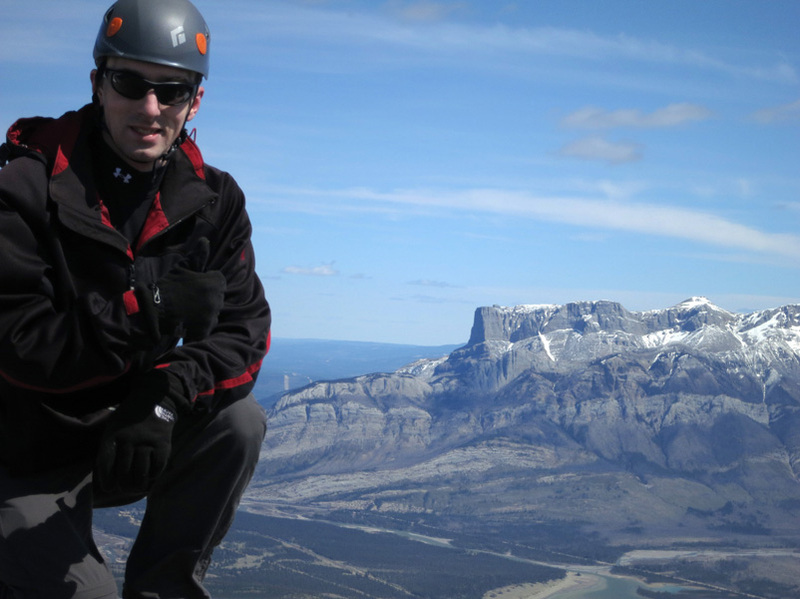 A moderate scramble with fun, hands-on sections along the southeast rib. 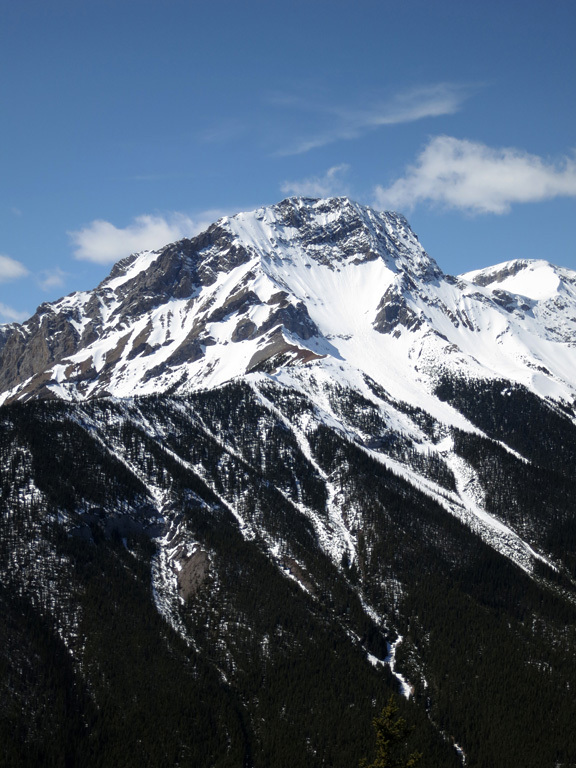 As a sub-peak of nearby Roche de Smet, Mt. 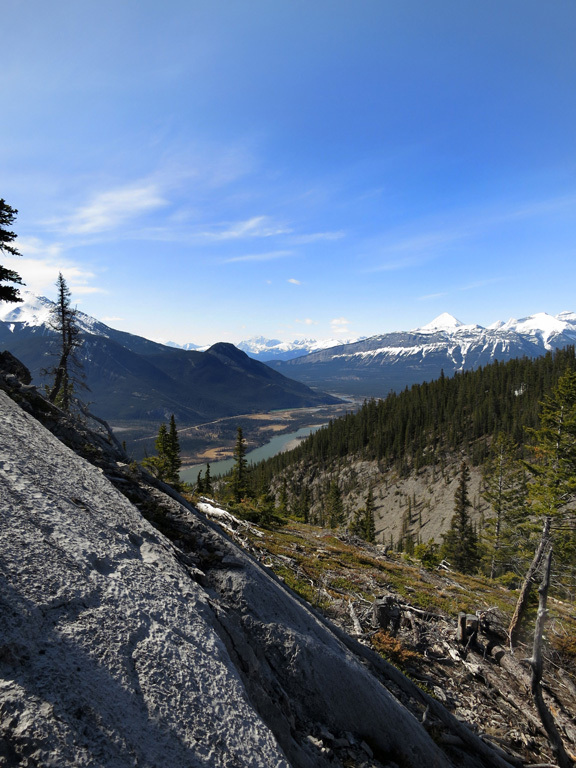 Greenock is little known and rarely climbed by visitors to the Jasper Lake region of Jasper National Park. What few may know, however, is that Mt. Greenock serves as one of the best vantage points in the area. 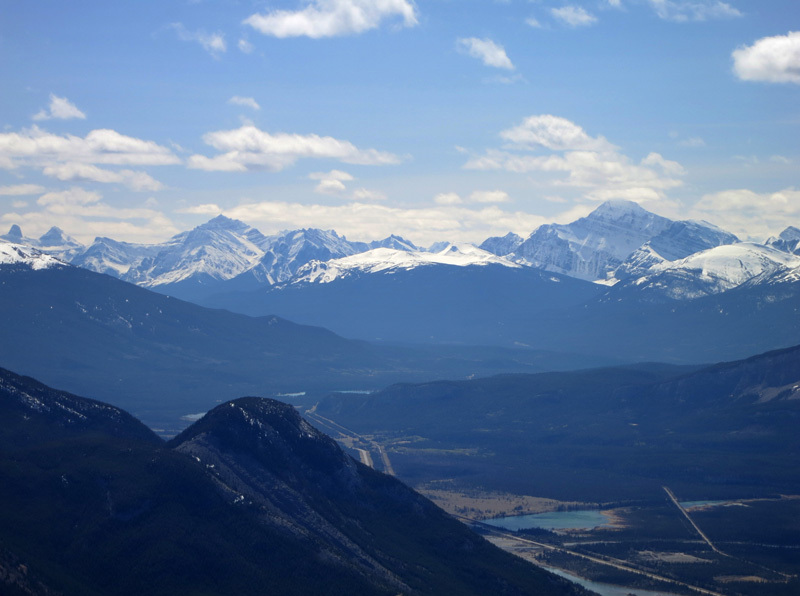 It provides great views of Roche Miette, Gargoyle Mountain and many other named peaks, a commanding view of the multi-coloured Jasper, Edna and Talbot lakes, an absolutely spectacular view of Pyramid Mountain and, on a clear day, direct views of the best aspects of Mt. Fryatt and Mt. 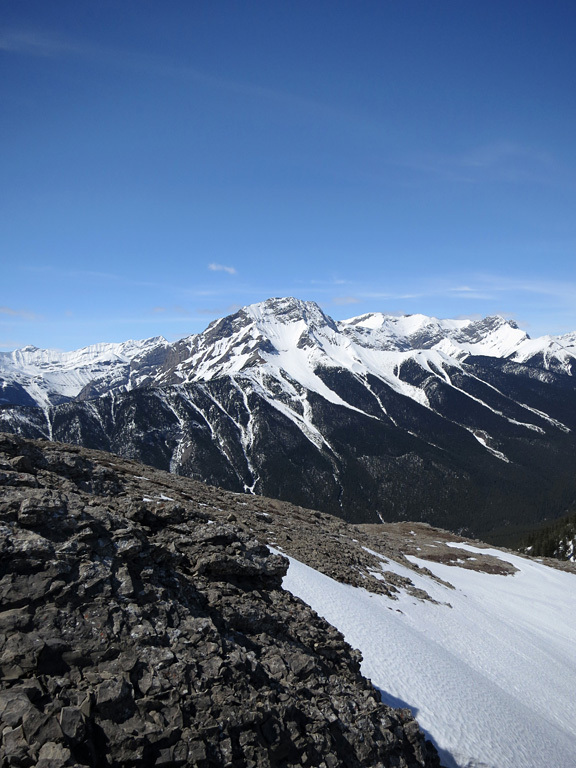 Edith Cavell — two of the highest peaks in the region, both exceeding 3,350m / 11,000 ft. in height. Aside from the views, Mt. Greenock also provides interesting examples of what lightning can do to an alpine forest, as there are several small patches of fire damage littered along the ascent route. Mt. 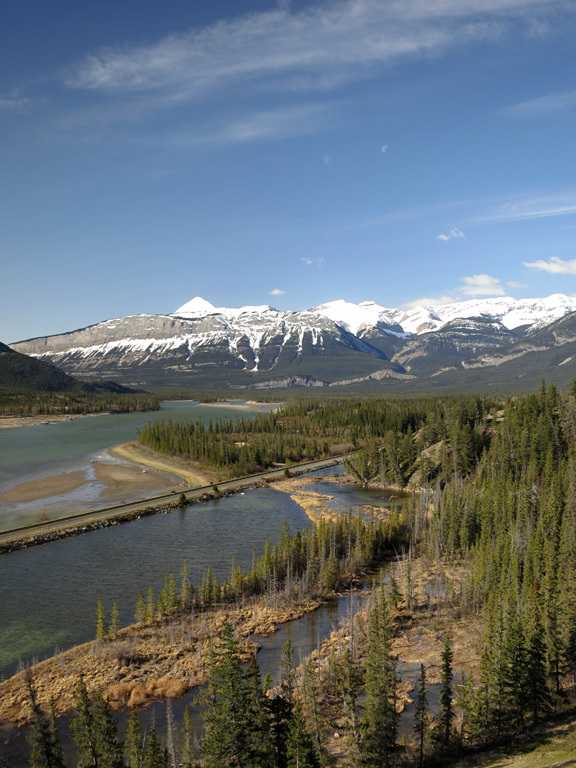 Greenock can be reached by following the Celestine Lake Road, which branches off from the Yellowhead (Hwy 16) 8km north of the Town of Jasper (look for signs advertising the Snaring River Campground). The paving of the road ends shortly after the campground, but due to recent grading work, the unpaved portion is actually in better condition than the road which leads to it. Following this section for roughly 8km will bring you past the historical homestead of Ewan Moberly, a warden station, and then a small parking/turn-around area next to Corral Creek. Your next step will depend largely on the ground clearance of your vehicle, as there's a creek to ford, and your willingness to subject yourself to the road's prescribed timetable. Although the photo doesn't show it particularly well, there are reasonably steep, foot-tall ramps at either end of the ford. I wasn't very confident that my car, and its 6" of ground clearance, could cross without bottoming-out, so I opted to walk to the trailhead from that point instead of driving. Walking from this point adds about 6km, and close to an hour, to the overall trip. 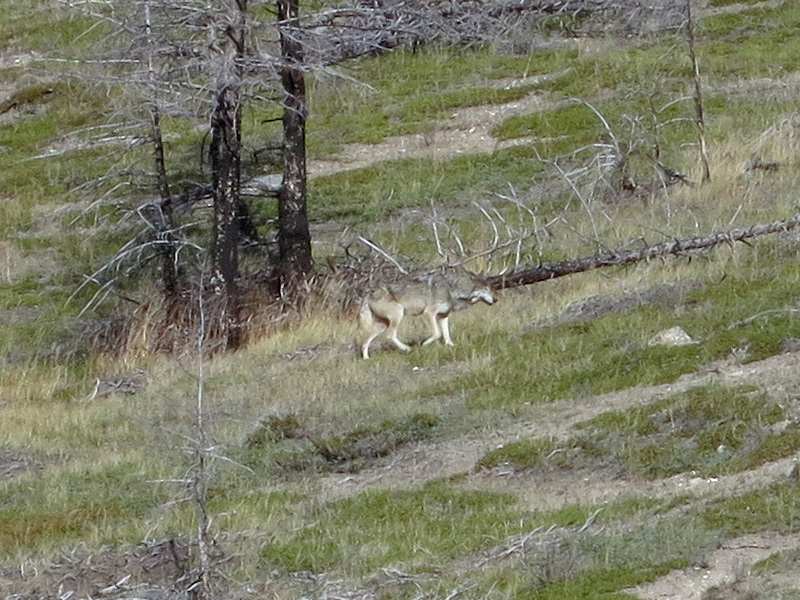 It's an easy walk or a quick bike ride, and I was fortunate to see several deer and a wolf for my trouble. 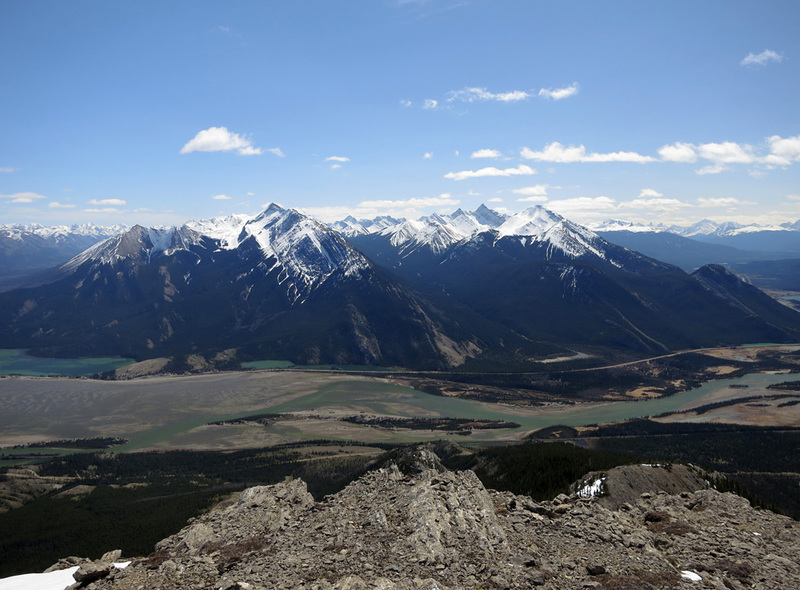 There are three “ribs” to Greenock mountain, and road contours closer to Jasper Lake to get around each of them. You'll find the trailhead after the 2nd dip in the road, between the 2nd and 3rd ribs. If you managed to drive past Corral Creek, there are a couple of spots here where you can pull off the road and park. After a brief climb up to the wide oil pipeline right-of-way, which has a series of logs draped across it (to discourage vehicle use perhaps? 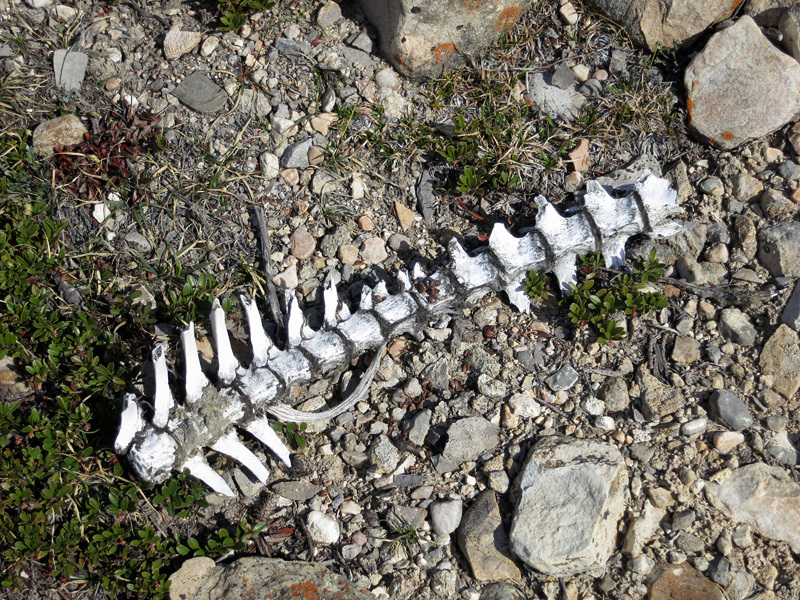 ), you'll want to begin following the white, rocky, “eastern rib” on your right up the mountain. 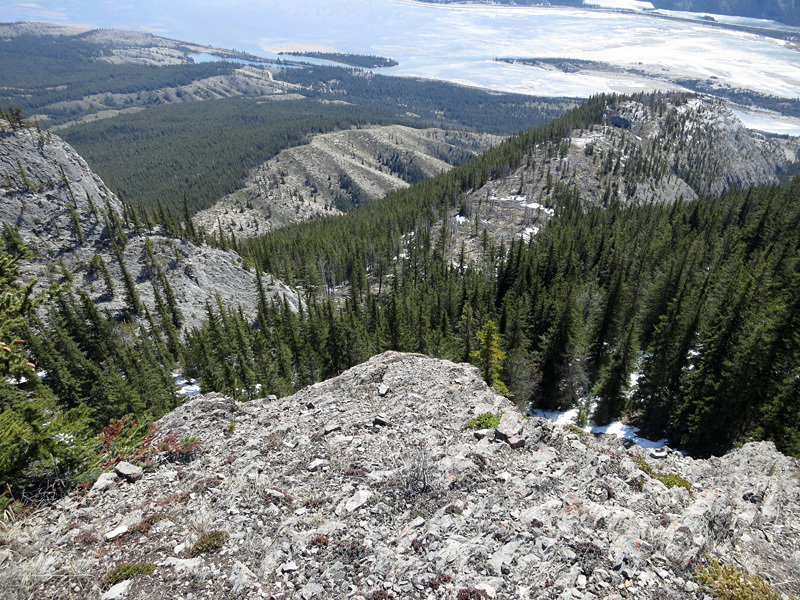 You'll quickly note that there are no cairns (except for one on the summit) or obvious trails on Greenock, but the route-finding is reasonably easy for the most part, with good rocky slabs to scramble when that becomes necessary. A good rule of thumb to follow for pretty much the entire ascent is to stay to the left side of the ridge and then drift towards the centre only as needed. Following that guideline will allow you to completely bypass the second highpoint on the eastern rib, which leads to a game trail that will bring you back to the centre, and a reasonably easy ascent on good rock to the third highpoint. From there, it's a quick ridgewalk to a point where the eastern rib finally becomes cliffed-out, and you must traverse over, through the trees, to the “western rib” to continue towards the summit. This traverse was the most challenging part of my day, thanks to a combination of a steep slope, knee-deep snow between trees, wet soil, and very loose rock in the open areas I could find. I eventually friction climbed my way on to a slightly exposed, rocky outcropping to escape that mess. Thankfully you only need to gain about 100 metres to reach the next ridge over, and I guess that the traverse would be far less arduous later in the summer once the snow's gone and things have dried out. From the top of the ridge, keep hiking up through a fairly clear area until you begin seeing a direct route to the peak area. 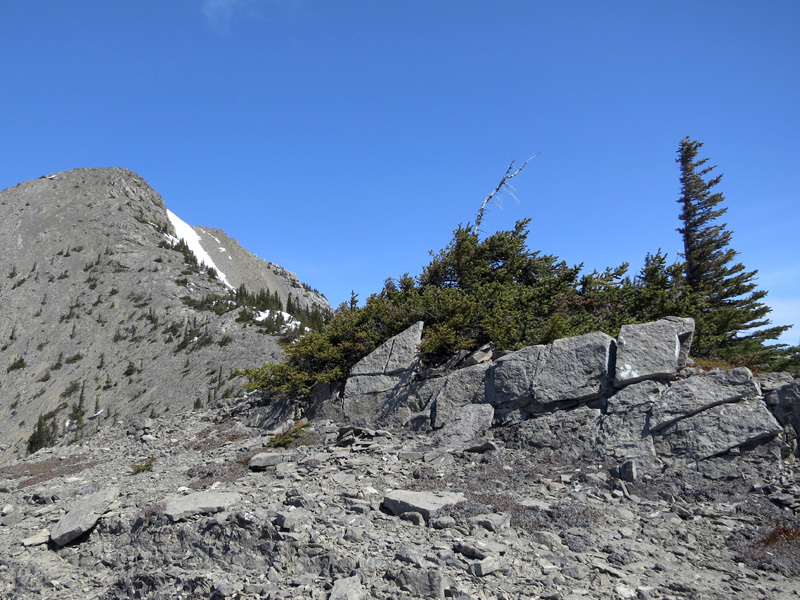 Even from that vantage point, you'll likely have the false impression that there are two approaches to the peak: a steep scramble to the left, and a climb up a scree gully to the right. In actuality, the gully is cliffed-out from both the scramble route and the peak of Greenock, leading instead to a col between Greenock and Roche-de-Smet. If you wind up in the gully through some mistake or another, such as not completing the traverse to the western rib, continue past the col and then circle to the western side of the mountain to be able to approach Greenock's summit from the scramble route. The scrambling route is a lot easier than it appears from a distance, and after a short while, you should find yourself on the summit. Retrace your steps for the descent; however, instead of traversing, continue to follow the western rib all the way down to the oil pipeline right-of-way. This will require several short bushwhacks while you try to string the various open areas together, but it's not too bad. Which direction you go from there will depend on where you parked. If you managed to cross Corral Creek, you'll need to head to your left (east) to return to the trailhead. 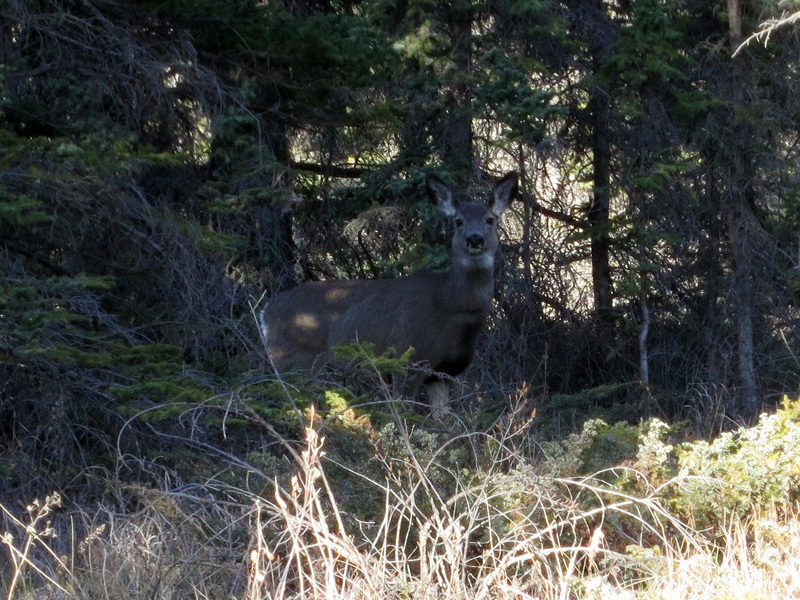 If you didn't, head directly west along the right-of-way for a quick shortcut back to the road and the Corral Creek parking area. More information about the creek crossing: I figure that having 8-10" of ground clearance, with reasonable front/rear overhangs, should be sufficient for a vehicle to ford the creek. If in doubt, you could also spend a few minutes gathering nearby rocks to build a more gradual ramp to ensure a damage-less passage for just about any vehicle. 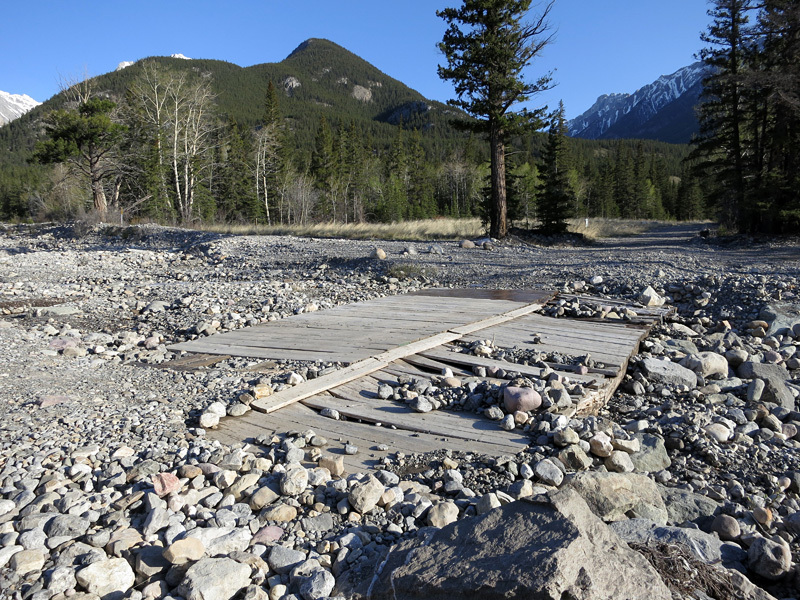 On a mild weekend with plenty of snow left to melt in nearby mountains, the creek remained bone dry for both of my crossings. You may only have water to deal with during periods of heavy rain(?). 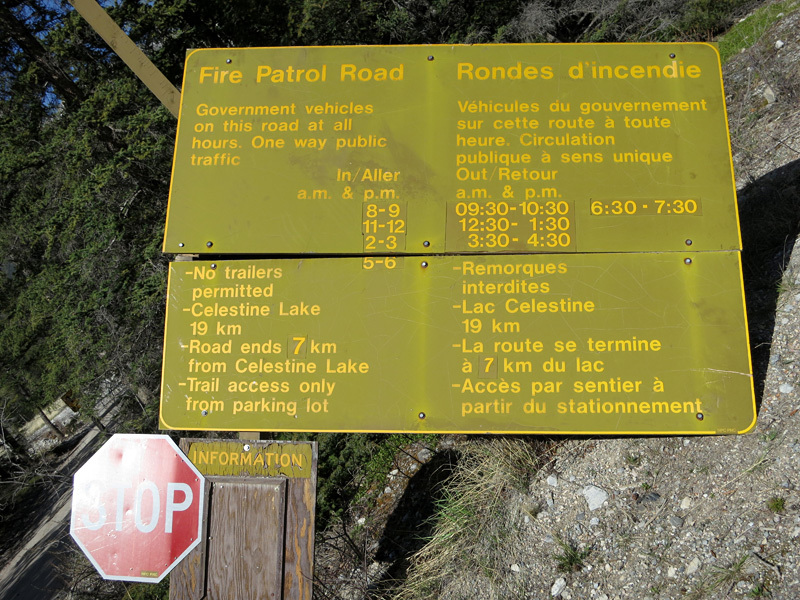 I would not recommend attempting to reach the peak of Roche de Smet via Mt. Greenock, as the ridgeline between the two looks fairly “notchy”, and could require plenty of downclimbing to get around various obstacles. My suggestion would be to follow the Vine Creek Trail to its end while looking for an alternative approach route to Roche-de-Smet's summit from the northwest. 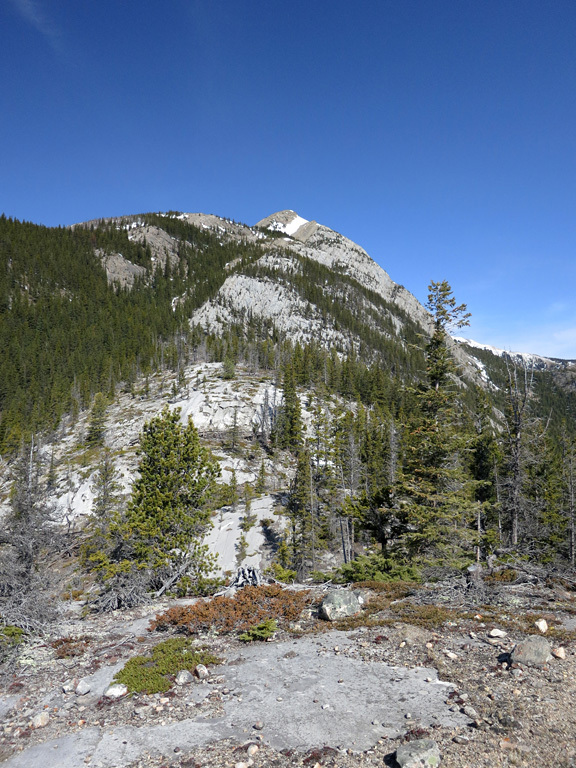 I learned of this climb through Potter's Ridgewalks in the Canadian Rockies, and although it included some good information in terms of accessing the area, I found the details concerning the climbing route to be lacking. That said, the book provides some history about the mountain and information concerning the wildflowers you may encounter while there (my visit was before the blooming season). Summit: 2,279 m / 7,477ft.